Each year, thousands of people across the United States are killed and more than 100,000 are injured in commercial truck accidents. Between 2010 and 2016, the number of fatal large truck crashes in Massachusetts increased by 26%. In a collision with a large truck or other heavy commercial vehicle, a passenger car or light truck is at an obvious disadvantage. In large part due to the size and weight of a commercial truck, occupants of other vehicles, motorcyclists, bicyclists, and pedestrians are more likely to be killed or injured in a commercial truck accident than occupants of the truck. In fact, truck drivers and other occupants of the truck account for only about one in five truck accident fatalities and one in four truck accident injuries. The larger size and weight of trucks and many other commercial vehicles can make accidents more likely, as well. Taller vehicles are more significantly impacted by high winds and more likely to tip. Semi-trucks and tankers have a larger turning radius than smaller vehicles, and visibility may be decreased. And, of course, larger and heavier vehicles are more difficult to maneuver and take longer to stop. The most common equipment-related cause is brake failure. Overweight vehicles are also a frequent crash factor. Whether the driver was negligent, the vehicle was poorly maintained, or the truck was loaded beyond the safe limit, those injured in a commercial truck accident may be entitled to compensation. However, commercial trucking accident cases can be complicated. An experienced personal injury attorney is generally beneficial to anyone injured in a motor vehicle accident. 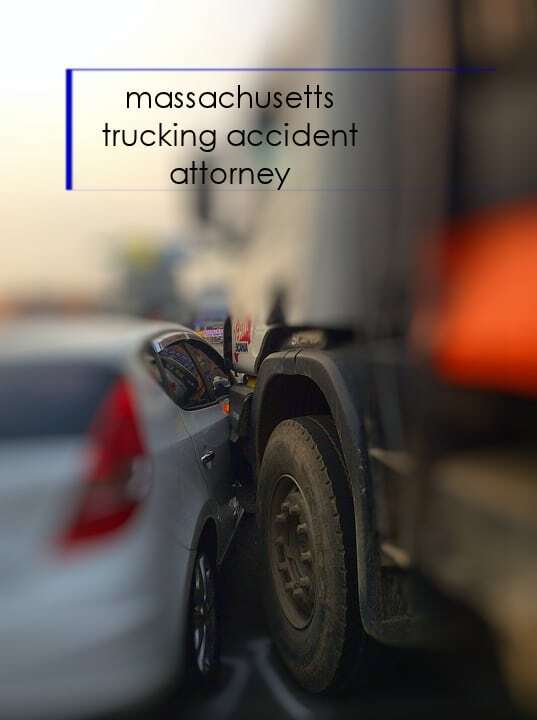 However, if you’ve been injured in a Massachusetts truck accident or have lost a loved one to an accident involving a commercial vehicle, speaking with an attorney is all the more important. An experienced local truck accident attorney will know how to identify and work with the best available expert for your particular case, to take action to preserve evidence, and to sort out the often complicated interplay between state and federal law. If you’ve been injured in a large truck accident or have lost a loved one to a commercial motor vehicle crash, schedule a free consultation right now. Attorney Kevin J. Broderick will listen to your story, review the evidence available, and explain your rights and options. Give yourself the advantage of a seasoned advocate in your corner, right from the beginning. Call 878-459-3085 or fill out the contact form on this site to get started right now. We also represent victims of New Hampshire truck accidents.